Question : Is there an English name for chempedak? 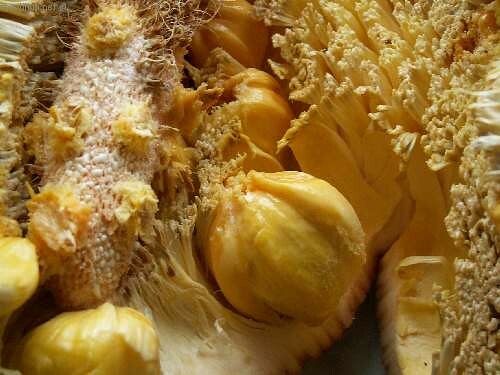 Nangka is jackfruit so what is chempedak? I think the chempedak is the next stinkiest fruit after the durians. Stinky but nice. You either love it or cannot tolerate it. 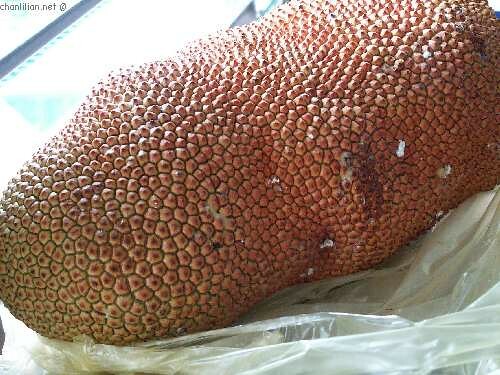 The chempedak is another seasonal fruit that will make its presence together with the durians, rambutans, mangosteen and langsats (hmmm, how come I haven’t seen any in the market?). It is an ugly fruit, I would say. With sticky white saps that make it unattractive. Cutting the fruit open is a chore because one can get the white sap stucked to the hands. To cut open, just slit the top of the fruit with a sharp knife, taking care not to ‘stab’ too deep. Just a simple slit at the top and you can tear apart the fruit. It reveals a middle stem and the each seed is nicely snuggled in this ‘nest’ of yellow stringy strips. The flesh of the chempedak is also very stringy. 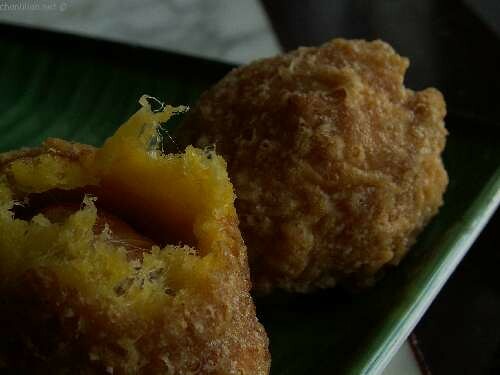 The chempedak is best eaten fried, as fritters. It can be eaten fresh too. Some people will boil the seeds with some salt and eat it too. 1) It is not flattering when someone referred to your clothes as ‘the casing of a chempedak (sarung chempedak). You see, when the chempedak is just fruiting (? ), the planters have to wrap each fruit in a casing made from the palm leaves. These casing will grow along with the fruit but towards the end, the casing will be too small. So, if someone said ‘sarung chempedak’ it means that you have grown too fat for your clothes. 2) Always supervise small children when they eat chempedak. The stringy flesh is a choking hazard. So is the slippery seed. 3) To remove the sap from your hand after cutting the fruit, use cooking oil to rub. If still not removeable, smother with some talcum powder (or like I did, grab some rice and rub it off). 4) Chinese believe the chempedak will cause ‘wind’ or flatulence. Probably this fruit is too fibrous. Some people do get sick after taking chempedak. Pregnant womens and mothers who just delivered babies are usually forbid to eat, unless fried. If you are not careful in removing the sap and accidentally ate the fruit with sap, it can make your teeth yellowish because of the sticky sap stuck to your teeth. Do you know that there are foods which can cause our teeth to become yellowish? Check out this 12 foods to avoid to make teeth whiter. Small, cylindrical fruit with fairly smooth skin. Pulp has a sweet, juicy, yet creamy texture. Less fibrous and acidic than the jackfruit. Oh my God! That looks like a creature from outer space! Had chempedak fritters yesterday. So yummy. I think chempedak can also give you gas, right or not? I remember a professor who is a Oceanic history expert and the Polynesians would carry these with them.. Bread Fruit = cempedak! Looks fascinating. Can you eat it with alcohol or is it forbidden, like with durian?